The newly published findings may explain why there is less tick-borne Lyme disease in California than in the eastern United States, where the debilitating illness was first discovered and given its name. Melissa Kaplan notes: Of course, to those of us Westerners who do have Lyme disease, the fact that our cute little blue belly Sceloporous lizards de-Borrelia ticks doesn't do us a lot of good, not until we can get some of their anti-Borrelia proteins for ourselves! UC Berkeley entomologist Robert Lane has discovered that a substance found in the blood of the common western fence lizard kills Lyme disease bacteria in the gut of juvenile ticks that feed on it. It may help explain why there is far less Lyme disease in California than in the eastern United States, where the lizard does not live. The western fence lizard -- a commonly found species dubbed the blue belly lizard in California, can carry an average of 30 juvenile black legged ticks, which are about the size of a poppy seed. Three stages of tick development Larval Ticks pass through three stages of development. During each stage they eat one ``blood meal.'' 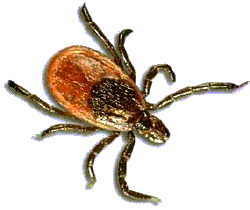 Larval ticks become infected with Lyme disease when they feed on rodents. Adult black-legged ticks move off the forest floor and onto plants and grasses. Those who feasted on lizards as nymphs are less likely to transmit Lyme disease to humans.